Venice Redentore - Fireworks Study 3, Watercolour on paper 22" x 30"
There is a great sense of liberation when painting fireworks. Beyond the oohs and aahs is a curious profanity about the spectacle: at first you sense a childlike fascination with flashes and bangs, then as the spent sparks fall back to earth and the smoke clears, a carefree disregard for order and correctness fills the night. Evidently Whistler felt this freedom in 1875 when he painted ‘The Falling Rocket’ and when Ruskin later accused him of “flinging a pot of paint in the face of the public” by exhibiting this painting, Whistler felt compelled to sue for libel, and to strike a blow for artistic freedom. It was actually a great painting, entirely free from the confines of veracity or what we would call photographic accuracy today. 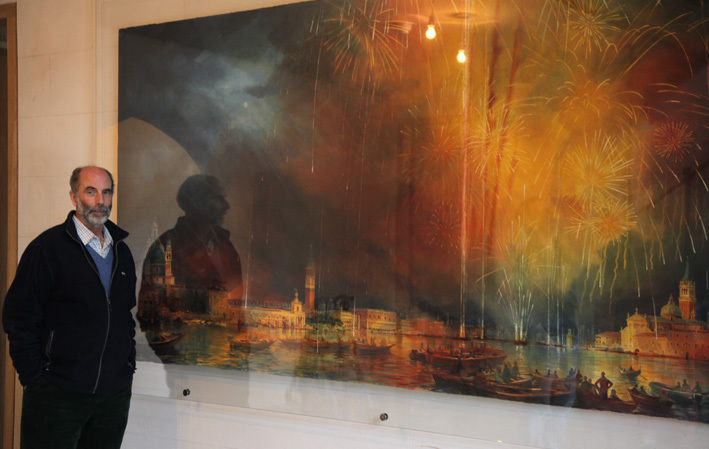 I have been commissioned to paint a large portrayal of Venice lit by the massive firework display which marks the passing of Saturday night into the Sunday of La Festa del Redentore. Traditionally the people of Venice mark the day by giving thanks for deliverance from plague, crossing to Palladio’s church of the Redeemer on Giudecca island. To get there they would lash all their boats together to form a bridge across which the populace could walk. Now a floating bridge is installed, and the night before the festival the Venetians take to their boats to celebrate out there on the water, between San Marco and San Giorgio and along the Giudecca. It is the most important evening in the Venetian calendar. Eagerly we got our little boat ready, stowing an anchor, torches, chairs, a mattress for sleepy children and a bucket…. also my drawing machine loaded with dark blue paper and some vivid crayons. Then we loaded up with good Venetian dishes of marinated sardines, some crab pasta, pimento salad with pecorino cheese, plenty of wine and some grappa for emergencies (e.g. running out of wine). Then we dropped anchor in the best spot to dine and cheer with the locals as the sun went down, waiting for the fireworks to start at 11.30pm. I had painted fireworks before in Venice but from on land, from rooftop vantage-points and once from the terrace of the Cipriani, but to be on the water right in with the action was breathtaking. I wanted a clear view which stretched from the Salute on the left, past La Dogana, The Doges Palace and around to San Giorgio on the right. This was a tough drawing which I worked on in daylight, with plenty of detail and accuracy necessary. 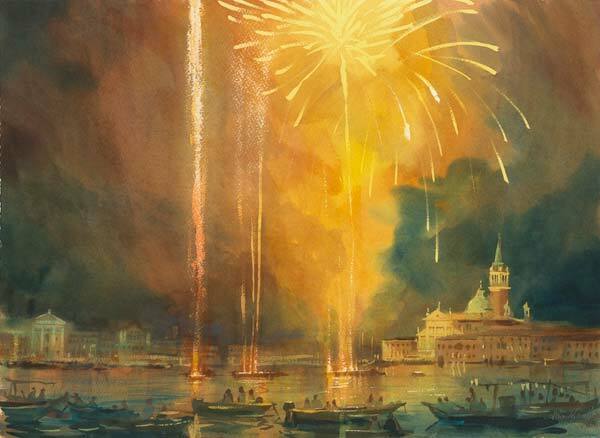 But when working on the colour sketches and larger watercolour studies (such as this Painting of the Month), I discovered that the light effects and the drifting smoke of the fireworks allowed, even encouraged, a disregard for the detail. So the sacred reverence for architectural precision to which I had become entirely loyal in the development of my work, was beautifully corrupted by the profanity of light and colour. And no critic could accuse me of rendering the Doges Palace in the wrong colour, for example, or getting the light wrong on San Giorgio. I was free to do what I liked. And if I felt like leaving out some building or part of the view, I could obscure it with smoke or with the gouged flash of an explosion as another salvo of rockets fired off the firework barges. In short, Venice was merely the context or backdrop, the subject of the painting was light and colour. This was liberating! I scratched away with a razor blade slicing the exploding trails of fireworks across the night sky. When I had been painting the ruins of abandoned country houses, twenty years ago, I had been similarly liberated. Ruins allow the loosening of the facts in order to place the emphasis on the mood of the painting. The absolute truth is rarely poetic, and reality is seldom lyrical. Turner reputedly berated a spectator who had been dismissive of one of his landscapes, suggesting that they had never seen a sunset such as the one Turner had painted; his reply was along the lines of “ah yes, but wouldn’t you love to?”. If you’d love to see Venice as you’ve never seen her before, I should have the finished painting ready in a month or so. 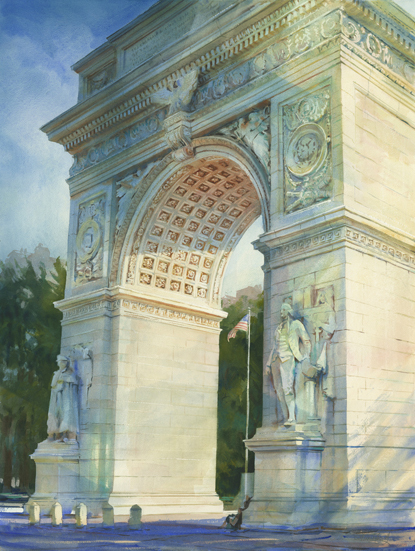 It will be the largest representational watercolour ever painted, at ten feet by five, just over three metres wide! In the meanwhile some more of these firework studies can be seen here.